The names of three Watford managers, past and present, will be highlighted tomorrow when we face them at Vicarage Road. There’s current manager Javier Gracia, former manager Sean Dyche and probably their finest ever manager Graham Taylor who passed away two years ago last Saturday. 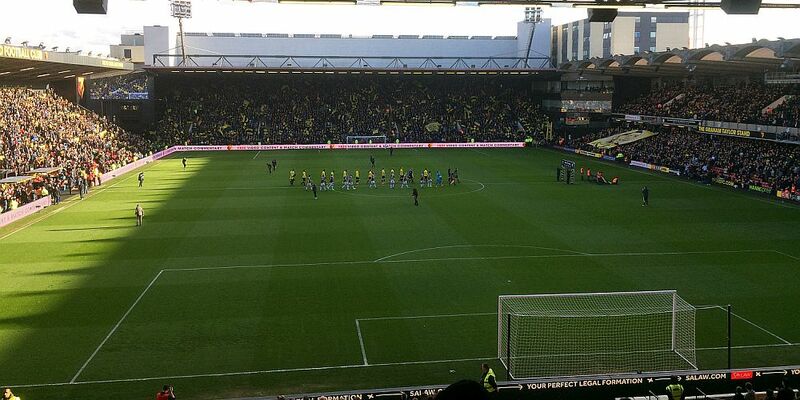 Watford will be honouring Taylor ahead of kick off and that’s no surprise. Along with then owner Sir Elton John, he transformed the club from that of a lower division club to one competing at the top level of English football. You could say Taylor and John helped Vicarage Road become the Yellow Brick Road as they went to an FA Cup Final at Wembley. It’s much more recently that Dyche was there. He was in charge for the 2011/12 season but was dismissed when the new owners came in. They’ve done well since, winning promotion in 2015 and now enjoying a fourth successive Premier League season. We are thankful to them, sacking Dyche made him available when we were searching for a new boss and we’ve hardly looked back since. Javier Gracia is their ninth manager since Dyche who is now into his seventh year as Burnley manager and is hopefully coming out of one of very few difficult patches we’ve had in that time. Not too long ago we were wondering where the next win was going to come from. Following the successive wins against Bournemouth and Cardiff, we were approaching 2019 with only the early December victory against Brighton to add to the wins column. It is four on the run now, including three in the Premier League and while we are still some considerable distance away from being safe from relegation, things are certainly looking a bit better. Coincidentally, our trip there last season came on the back of three Premier League wins following a barren spell. We beat Everton at home then followed that up with away wins at West Ham and West Brom before arriving at Vicarage Road. The 2-1 win, reported below, is recalled by midfielder Jack Cork who scored the winner. With no sign of any incoming players in the window, and with players still unavailable, Dyche will again be counting the numbers, although things are improving. It looks as though Jόhann Berg Guðmundsson will be ruled out again. He’s started just two of the last six Premier League games, those against West Ham and Huddersfield. Robbie Brady will serve the final game of a three match ban and, to add to Dyche’s wide player worries, Aaron Lennon is some way from returning after knee surgery. The manager spoke recently of the need to bring in an extra wide player but that is looking less likely now than it was a week ago, It leaves us with just youngster Dwight McNeil available but, given his performances since getting into the side, he’s very much there now on merit. I think there is every chance that the team will be the one that came from behind to beat Fulham last week. It could be: Tom Heaton, Phil Bardsley, James Tarkowski, Ben Mee, Charlie Taylor, Jeff Hendrick, Ashley Westwood, Jack Cork, Dwight McNeil, Ashley Barnes, Chris Wood. Subs from: Joe Hart, Matt Lowton, Kevin Long, Ben Gibson, Stephen Ward, Steven Defour, Matěj Vydra, Sam Vokes. Watford are currently in seventh place in the table, the one we occupied at the end of last season, now commonly known as the best of the rest. They have 32 points, 11 more than us, but last week’s win at Crystal Palace was their first since beating Cardiff in mid-December. Half of their points have come at home, with five wins and five defeats. Four of those defeats, however, have come against top six teams, the only other reverse at Vicarage Road was a 4-0 defeat at the hands of Bournemouth back in October. Their goals this season have been very much shared. Roberto Pereyra (pictured)is their leading scorer with six, followed by Troy Deeney who has five. Will Hughes, who scored his only goal this season at Burnley, is a major doubt having suffered concussion in their win at Crystal Palace, but there is positive news for Javier Gracia who should be able to call on both Christian Kabasele and former Burnley striker Andre Gray who have both returned to training following injury. Their team at Crystal Palace was: Ben Foster, Kiko Femenia, Craig Cathcart, Adrian Mariappa, José Holebas, Will Hughes, Abdoulaye Doucouré, Étienne Capoue, Roberto Pereyra, Gerard Deulofeu, Troy Deeney. Subs: Heurelho Gomes, Miguel Britos, Isaac Success, Domingos Quina, Ken Sema, Tom Cleverley, Adam Masina. Things were certainly looking up for the Clarets, chasing a Europa League place and arriving at Vicarage Road with three wins in the previous three games. Things were looking up, the We’re all going on a European Tour chants were at the fore and we returned home with another three points after a 2-1 win. The last three wins had all come on the road. In the previous game we’d won 2-1 at West Brom, a game that had the home fans restless, and prior to that we’d won at West Ham where the home fans had taken restlessness to the extreme. Embed from Getty ImagesThis time we had to come from behind to do it after Roberto Pereyra had given Watford the lead just past the hour. Twelve minutes later were in front with goals from Sam Vokes and Jack Cork and the game was won. Watford’s goal came at a time when they were very much on top although there was some really good fortune about the goal with Stephen Ward getting in a good tackle only for the ball to fall right into the path of goalscorer Pereyra. How did we come from behind? A few minutes later, Sean Dyche replaced the disappointing Georges-Kévin NKoudou with Sam Vokes, the change paid instant dividends. We were waiting to take a free kick when the change was made. Adrian Mariappa got his head to Ashley Westwood’s free kick but could do no more than head it down to Sam who scored just 22 seconds after coming on. Three minutes on and the game was won. Another free kick, this time on the left, Westwood again. Kevin Long, beyond the far post headed it back for Jack Cork who saw Orestis Karnezis save his header. It then came off the post, Ashley Barnes had to attempts before Watford scrambled it away. Through most of this, Westwood had arms in the air claiming the ball had gone in. it had, referee Paul Tierney checked his watch and goal line technology had confirmed Cork’s header had crossed the line. The game was won.